Introducing a hugelkulture bed dedicated to edible flowers will expand the knowledge of sustainable agricultural practices of members of our Youth Service Corps (YSC), a job and life skill training program for urban teens. This new focus will expand the footprint of the YSC Edible Park Project and integrate well with other current YSC projects, including the Fruit Tree Project (a backyard fruit tree census), Bee Wise beekeeping sessions, and Garden-in-a-Box. All YSC projects are crafted with youth and are intended to provide food sources for residents of our low-income, low-access neighborhood. 1. Construct and maintain 2 new hugelkulture beds containing edible flowers. 3. Participate in our weekly Farmers Market and sell 50 pounds of produce. 5. Donate 50 pounds of fruit to ANC’s food pantry program from Edible Park and Fruit Tree project. 6. Engage 3 local farmers and visit 4 local farms using sustainable agricultural practices. 7. Facilitate 3 beekeeping sessions with Bee Wise Farms. 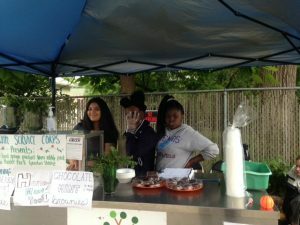 Youth learned about sustainable gardening practices, as well as the role of Edible Flowers within those practices, primarily through direct work. The time we spent in our “Edible Park” plot helped to foster active learning around these topics, where the youth practiced skills around watering, weeding, seeding, basic plant identification, and harvesting. While taking on these daily tasks, we would talk about why these skills mattered, and how the plants were effected by outside influences as well (pollinators, rainfall, sun exposure, pest presence). Through harvesting, creating value-added food products, and then selling these products at our Farmer’s Market, youth also gained experience with the process that crops go through from farm to table. Not only that, but they began to gain enough understanding to help educate community members about these same concepts and skills that they themselves had just developed, through the creation of recipe booklets and small plant id sheets. 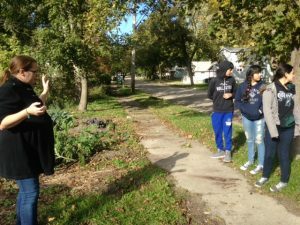 Through visiting several farms and demonstration gardens, youth observed a variety of approaches to gardening. At the Garden Project’s Demonstration Garden, we were able to see the advantages of using cold frames for growing, as well as a wide variety of the possible crops that can be grown in Michigan. At Urbandale Farms, we learned several methods to protect plants in drought-like conditions, as well as using drip tape for reducing time on watering. At Magnolia Farms, we learned about water storage using IBC totes, and about how to efficiently close out a gardening space at the end of the season. In a larger scale view, the youth learned more about the connections between these different farmers and gardeners, and how those connections ultimately form the region’s Agricultural Community. YSC visiting Magnolia Farms, which is run by Allen Neighborhood Center’s GardenHouse Manager, Egypt Krohn. The youth are looking at the former site of the farm, just across the street. 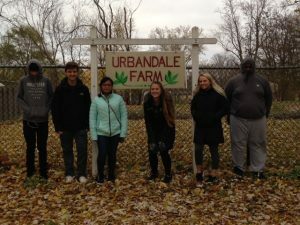 YSC visiting Urbandale Farms, one of several urban agricultural sites on Lansing’s east side region. We shared information about our project in a variety of ways. Program highlights are mentioned in Allen Neighborhood Center’s quarterly Eastside Neighbor newsletter (distributed to 3,500 Eastside homes) and Active Neighboring weekly e-newsletter (distribution of 2,400 and growing). 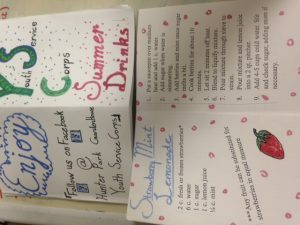 Our Facebook page, “Hunter Park GardenHouse Youth Service Corps”, is active, with pictures regularly posted of our activities. The Park Cart is a venue to discuss these projects with neighbors who purchase the value-added food products. We created our Garden-In-A-Box kits and promoted our programs through Allen Neighborhood Center’s Martin Luther King Day of service, with the help of 43 community volunteers. We also host the monthly Edible Park Collection Days, where the youth of YSC will lead neighbors through the garden, sharing what is available to be harvested and what to do with it. The Collection Days are promoted through community calendars and in person at the Park Cart. We had goals that were both qualitative and quantitative, which means we have results of both types. The first goal we established for our program (continuing the existing projects of YSC, while helping them understand and consider the role of edible flowers within sustainable food systems) was achieved. All of our projects not only successfully continued, but many also found growth over the course of the last 12 months. Our Edible Park garden expanded in multiple ways, with more space, more varieties and more harvesting by neighbors. Our Garden-in-a-Box project delivered 9 boxes to neighbors, with the youth installing them and filling them with soil, seeds and transplants (bringing the total number of Lansing residents served by this project to 157). Our averaged daily sales from Park Cart were the 2nd highest in the past 5 years. The youth explored sustainable food systems, covering the topics of food insecurity, supply chains, social justice as pertaining to food systems and affordability in program discussions. Through their discussions and active work around these topics, the youth learned about the attributes of sustainable agriculture as identified by NCR-SARE: they used ecologically sound practices, creating hugelkulture beds, and utilizing integrative pest management. Their growing was profitable, as they cooked and baked with their produce and sold those value-added goods at their Park Cart at the Allen Farmers Market, which as mentioned, had a high sales rate. The youth’s projects and growing were designed around a principle of social responsibility: they distributed those Garden-in-a-Boxes to low income, or senior neighbors; their Edible Park garden was free to be harvested from by any park visitor; and the youth led Collection Days, teaching neighbors about what was growing in the garden, how to identify and harvest it, and what to cook with it. The audience of youth we were trying to reach was residents of Lansing, specifically those in the Eastside neighborhood. Through outreach visits to our local high school, middle school, and several youth-based community organizations, we experienced a far greater exposure of our program for the summer season by neighborhood kids. We used pre- and post-surveys, attendance, weighing of produce and neighbor engagement to measure results. Based on surveys, 60% of our members reported feeling “knowledgeable” or “very knowledgeable” about crop planning, integrated pest management, sustainable maintenance practices, food safety, and marketing at the end of the summer. During the course of the summer the Youth Service Corps members harvested 25 pounds of produce. The youth engaged 12 neighbors between their Garden-in-a-Box deliveries and Collection Days. Finally, over the course of the project, 24 individual unduplicated Youth Service Corps members participated over the course of 81 program sessions, with a total of 252 duplicated youth engaged through Youth Service Corps. Over the course of this project, I gained a greater understanding of the complex nature of working with youth around gardening and sustainable agriculture. While my previous experience of bringing horticulture and food access to community members proved valuable, teaching through enabling skills in youth was fairly new to me. There were many things to learn and adapt to, both for the Youth Service Corps and myself. The participating youth demonstrated an appreciation for the practices of cooking, gardening, and marketing, as well as proficiency in carrying out those practices. 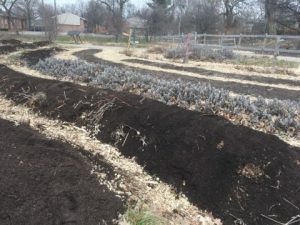 There were tangible successes in the establishment of two additional hugelkulture beds, to expand the Edible Park program’s capacity for growth, and the planting of two Edible flower beds. The enthusiastic engagement in our Park Cart program, which focuses on skills around food safety and marketing, was another measured success. YSC volunteering time for our Park Cart program, with sprigs of Mint and Woodsorrel available for sampling. One of several recipe books for our Park Cart value-added menu items. The result of all the Global Youth Service Day’s work. The rows have new compost mixed in, and mulch to make clear pathways, and the new Hugelkulture beds have been established. As mentioned above, I entered into this grant period without much direct experience of working with youth of this age range on sustainable agriculture and the changeover between myself and the previous Youth Programs Coordinator created several obstacles, in terms of developing rapport with the participating youth and understanding the outcomes planned for the first 12 months of the grant proposal. Due to these obstacles, the poundage of harvested produce from Edible Park was lower than expected, and youth were unable to participate in planned Beekeeping sessions. We will be creating a more thorough plan around this summer’s programming, specifically to address the missed Beekeeping Sessions and Edible Park growing season. Through including more curriculum on Edible Flowers and their place within sustainable food system, and placing an increased emphasis on efficient crop planning, we will continue to build on the successes from the last 12 months, and achieve our remaining objectives. Through field trips to several local farms, the youth participants in our program gained greater understanding of the Local Food Systems. The potential for future field trips to these (and other local) farms has also increased as a result of these interactions.